For a jaded old eater-outer like me, reading a menu where almost every single dish’s description contains a word you’ve never heard before, is a Very Exciting Prospect indeed. So when, on my first visit to Etto, a restaurant that had been “on my list” to visit since early in the New Year, I feasted my eyes on a menu full of words like “botarga, vitello tonnato, nduja, agnolotti, fonduta, malfatti, trompettes, persillade,” I knew that an eating adventure was about to begin. I’ve been lucky enough to eat at Bocca di Lupo in London, and this was the first time I’d seen the same type of ingredients on an Irish menu as you’ll find on the line-up at that celebrated Soho haunt. Etto is a blink-and-you’ll-miss-it white shopfront located a couple of doors down from O’Donoghue’s and across the street from Foley’s (Yes I’m Irish, I use pubs as directions), near the junction of Ely Place and Lower Baggot Street. A chalkboard outside has been proudly proclaiming Etto’s awards for Best Casual Dining at both the Food & Wine Magazine Awards and the Irish Restaurant Awards earlier this year. Awards aside, the term “Casual dining” doesn’t do Etto justice at all, in my opinion. The minimal interior feels casual, with slightly uncomfortable wooden seats and bare white walls, but there’s nothing casual about this food or about the ambitious, regional Italian-influenced menu. This menu changes daily and is divided into small plates, large plates and desserts. You can treat this as “starters, main courses and desserts”, or simply take the “small plates” approach to eating and pick and choose a few dishes to have with a glass of wine. 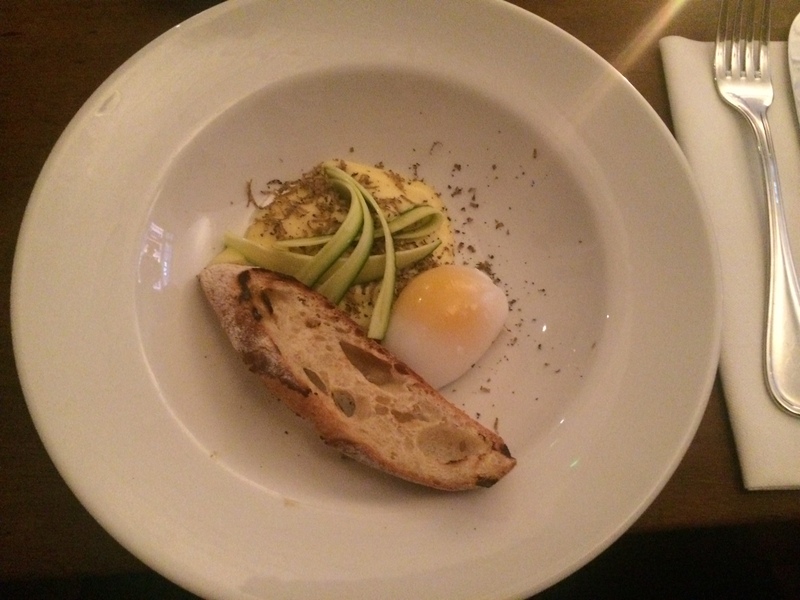 It was an almost impossible decision to pick a starter from the list of small plates, but on the guidance of our lovely waitress, I ordered Duck egg with fonduta, courgettes and summer truffle. Fonduta, it turned out, has the texture of mashed potato but is actually a cheesy puree (Fonduta – Fondue, the penny dropped) from the Piedmont region that was delicious mixed with the runny duck egg and scooped up with the toasted bread. I was dining with my Best Friend Since We Were 4, I’ll call her BFSWW4 for short. The occasion was the belated celebration of both our birthdays (AKA: any excuse for a Thursday night out), so we’d already decided upon clapping eyes on the menu that we’d be going for the full 3-course option. 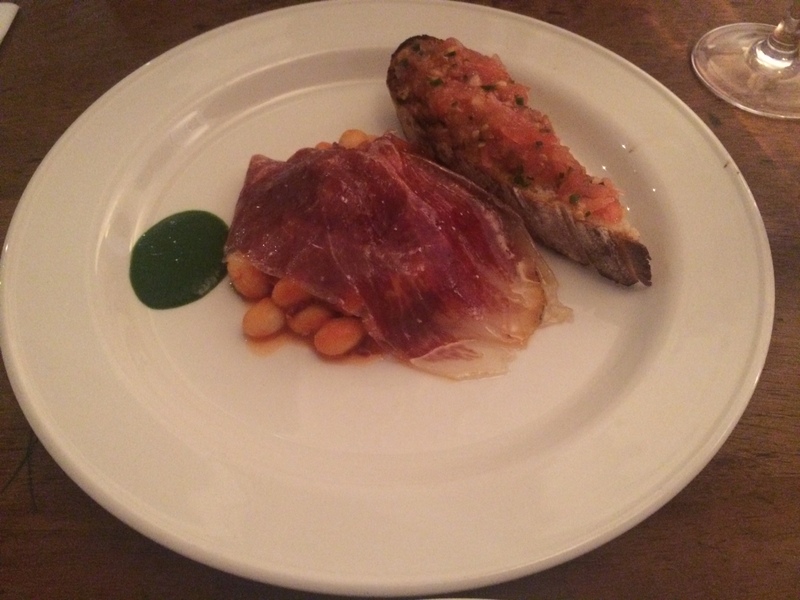 For her starter, BFSWW4 had Coco beans with jamon iberico and tomato toast, which was heavy on Spanish influence. It was all I could do not to scoff her iberico ham, but I settled for just a taste. Coco beans, jamon iberico, tomato toast. Our enjoyment of these small plates was greatly helped by our quaffing of a lovely Ponte Del Diavolo Pinot Grigio from Friuli, which we were already hailing as “the nicest white wine ever.” Now, I’m not usually one to get excited about Pinot Grigio, but this was really delicious. At €37, it wasn’t cheap, which indicated to me that maybe throwing money at the problem is the key to enjoying Pinot Grigio. The photo that you see at the top of this post shows our main courses – in the front, my roast hake with new potatoes, trompettes (little mushrooms, fact fans) and brown shrimp. The generous portion of fresh hake was topped with a little cloud of foam that added a fine-dining flourish. A perfect plate, which I added to with an unbelievably fresh side of heirloom tomato salad with goat’s cheese and marjoram. BFSWW4’s choice was a lamb shoulder with summer turnips and a mint broth, the latter of which was poured over the lamb when the dish was served to our table. We shared these two fantastic dishes while enviously looking at the giant portions of pork chop with romesco sauce and cavolo nero being devoured at the table beside us. Even after all this, there was still room for something sweet. And with more desserts on this menu than there were large plates, I was happy to see that this is clearly a place where they take their sweet tooth seriously. Not just the token sweet dishes or crowd-pleasers at the end of the menu, here was yet another opportunity for Etto to showcase that they’re really doing something impressive here. 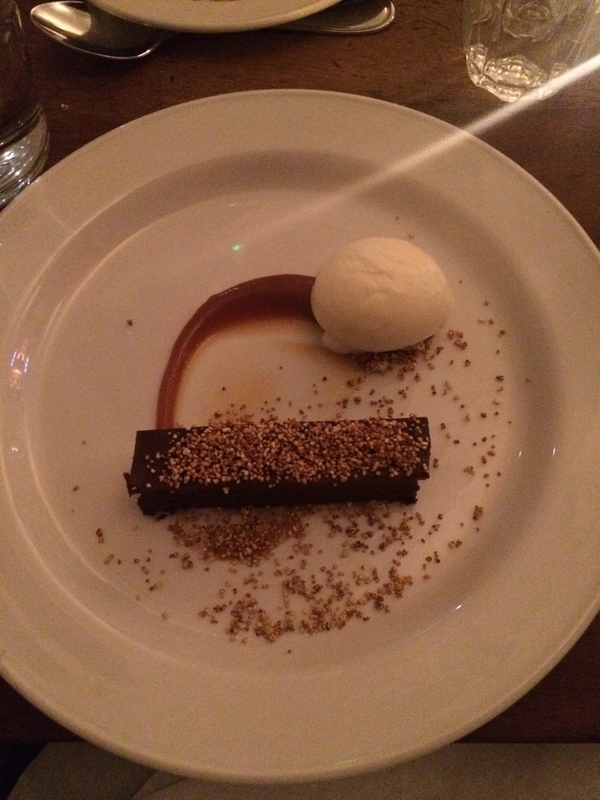 My flourless chocolate cake was served, not with the vanilla ice cream or cursory blob of whipped cream you’d expect, but with with sour cream ice cream – an amazing foil to the dense sweetness of the chocolate slice. Flourless chocolate cake with sour cream ice cream. For our second dessert, we passed on the recommended Red Wine Prunes & Vanilla Mascarpone, in favour of a Peanut Butter Semifreddo with poached apricots. Days later, I was still telling anyone who’d listen about that delightful semifreddo, which was spooned up before I even remembered to capture it with a photo. With small plates between €10 and €12, and the large plates ranging up to €28, there was nothing “casual” about our bill at the end of the night, but it felt worth every cent. Next time, I think a great plan would be to sit at the bar with a glass of prosecco (on tap for €7 a glass) and a couple of small plates – it just looked more fun up there, with the added bonus of making the experience a bit easier on the wallet. The pre-theatre menu is also great value at €24 for two courses or €28 for three, with many of the same dishes as the a-la-carte menu, if you can squeeze in between 5 and 6.30pm. Since this visit, I’ve since tried and failed to book twice for Saturday nights, but they’ve been booked out more than a week in advance both times. So do as I say, not as I do, and get with the forward planning so that you can enjoy this Irish/Italian gem for yourself. Etto, 18 Merrion Row, Dublin 2. Tel: +353 (1) 678 8872 or check out their website for full menus and the fabulous wine list.